What a fun book! Jessica, widowed mom of two kids, is attacked when taking out the garbage one night by a crazed, vamp-on-the-loose. 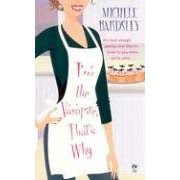 What follows is a great, chick-lit type paranormal with laugh-out-loud scenes. I really enjoyed this one, and look forward to the next one in this series!